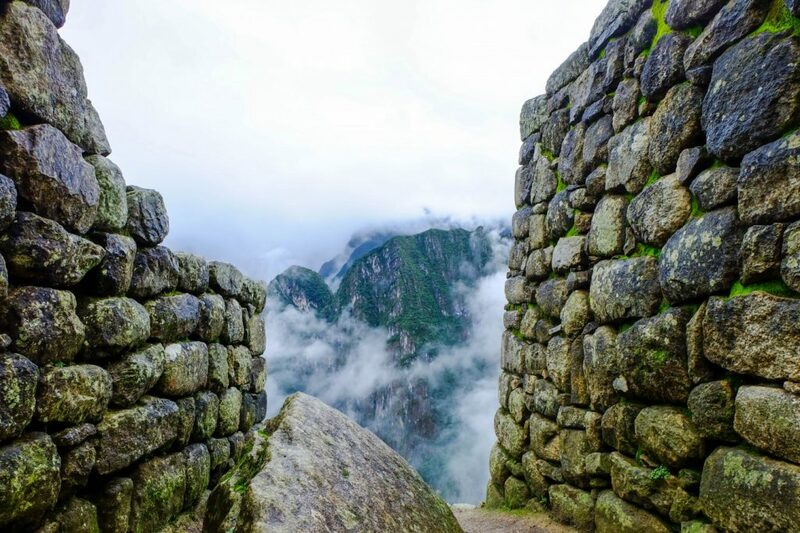 Making the Best of Rainy Days at Machu Picchu » Lavi was here. I pressed, “Play” on my new WhatsApp message and listened to my Canadian friend Becky quickly detailing our next master plan. 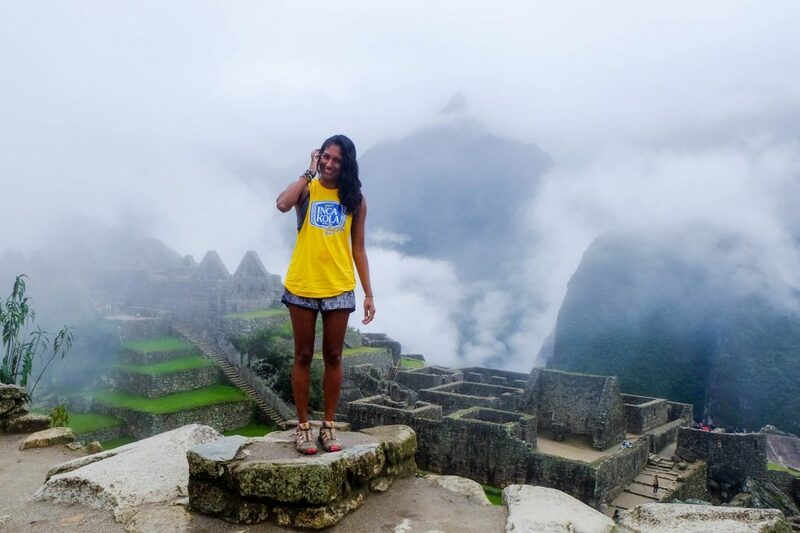 Her friends just got back from Machu Picchu and their entire trip for two days was cheap. 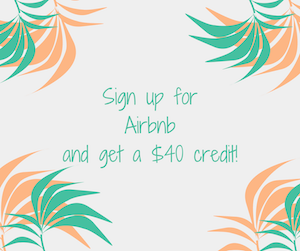 We could easily spend under $100 on our trip; it wasn’t going to be long trek, but we were okay with that. Things started and ended kind of disastrously. The middle part was incredible though. We were asked to exit the vehicle and instructed to enter the second van that was nearly full. After a half hour of confusion and vendors trying to sell us coca leaves and ponchos, we set off for Santa Teresa, a town near Hidroelectrica where we’d begin walking to Aguas Calientes. The van hugged the curves of a mountain as we scaled higher and higher into the mountains. Sitting in the middle seat, I had the unfortunate displeasure of having the man next to me constantly falling asleep on my shoulder and bumping into me as the van sways back and forth on each switchback. We didn’t know that the roads up the mountain were terrifyingly winding. 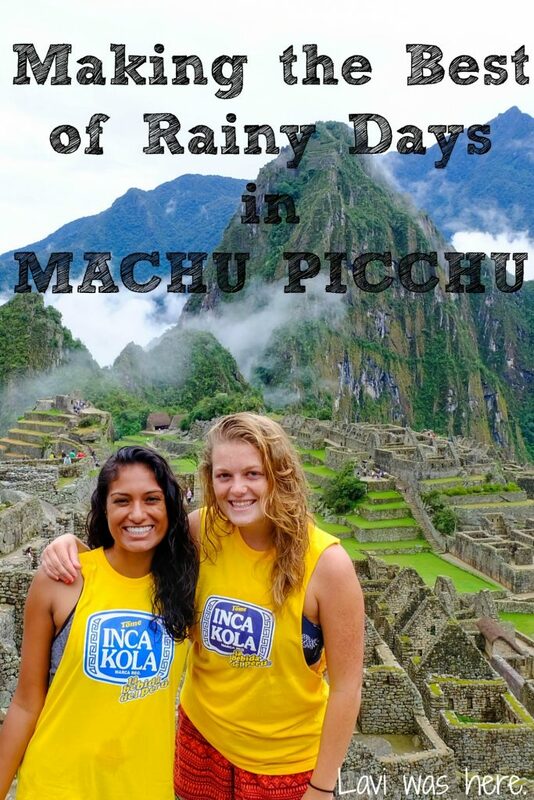 Okay honestly, this wouldn’t have really made a difference because we were going to go to Machu Picchu no matter what. 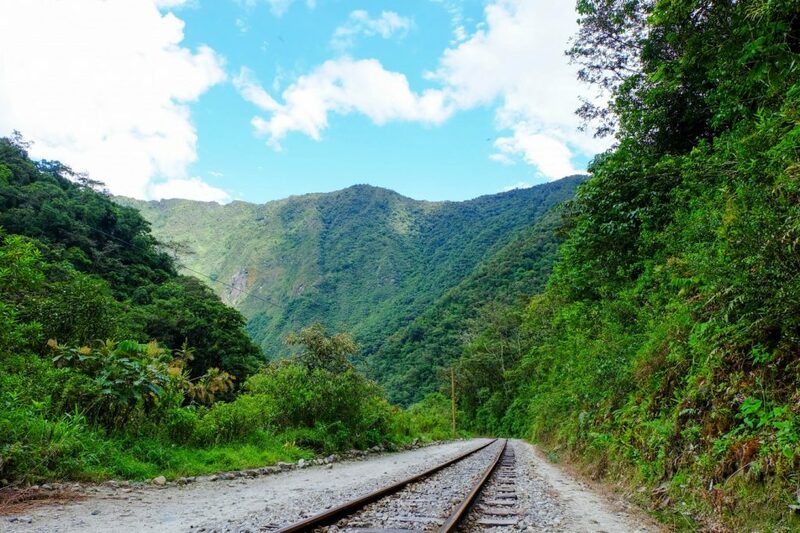 In Santa Teresa, we crossed the shaky pedestrian bridge over the river and about 20 minutes later, we were walking along the Peru Rail train tracks toward Aguas Calientes. We were in luck, it was warm and sunny. Becky and I kept saying to each other how beautiful it must be up at Machu Picchu. This was one of those “knock on wood” moments in which you don’t think you’re really jinxing yourself but you are. Don’t know what I mean? Read on. 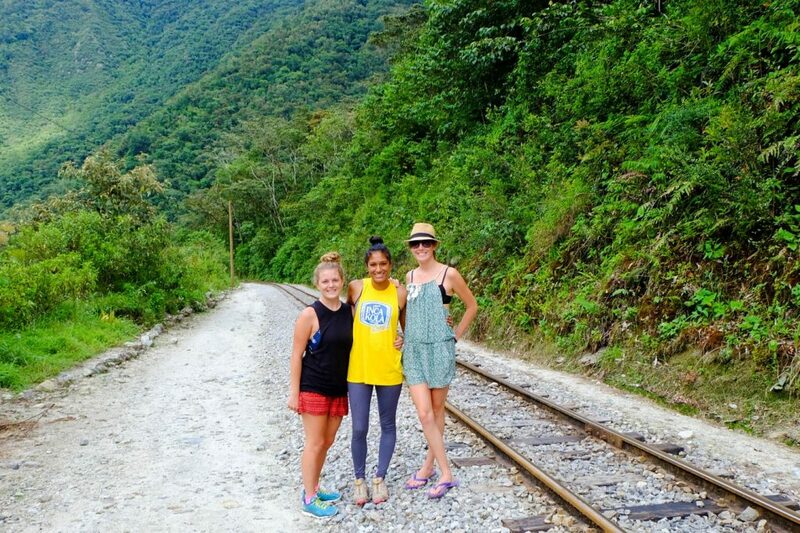 There were many others walking along the train tracks to Aguas Calientes with us, including Kate, an awesome South African girl I’d celebrated Carnival with in Montañita Ecuador. We caught up on the month that had passed by since we’d seen each other as we walked. 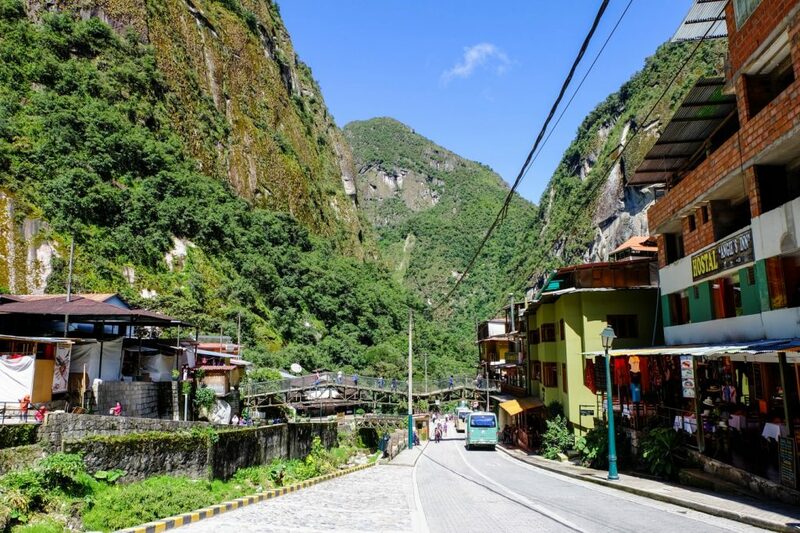 Aguas Calientes is a cute little town nestled in the mountains below Machu Picchu. Existing solely because Machu Picchu is nearby, it felt so strangely touristy. Each restaurant offered essentially the same set menu and the streets were flanked with massage and souvenir shops. We discussed what it must be like to be the locals living in Aguas Calientes as we wandered toward the outskirts of town. It’s hard to imagine having to take the train to get even close to the nearest civilization, and that town was still in the middle of nowhere. My alarm blared at 6am in our hostal room in Aguas Calientes, Peru, and I called out to Becky, “Snooze ’til 7?”. As soon as she said yes, I buried my face in my pillow and went back to sleep. This went on until about 9am, maybe 10, before we actually woke up and got ready to hike up to Machu Picchu. Our rationale? Everyone said they were waking up early to be the first people to the top. If everyone was doing it, they weren’t going to be the first and neither were we. We might as well enjoy a coffee, breakfast, and buy some sandwiches for our long day ahead. I felt cool raindrops falling on my head as soon as we started walking along the river toward the entrance to Machu Picchu. We gave each other one of those, “Are you f-ing kidding me?” looks and continued just one or two minutes before the light rain turned into a downpour. Remembering how nice it was the previous day as we walked along the train tracks, I cursed our luck. We stopped at the last souvenir shop we saw and tied plastic bags around our backpacks, laughing about how we’d been asked multiple times by vendors if we wanted to buy ponchos and now finding ourselves in a situation in which it would have been fantastic to have them. I did what I often do: ask questions hoping that the people I’m asking will answer the way I want them to. I asked the shop owner if he thought the rain would stop anytime soon. My question was met with a friendly laugh and shrug of the shoulders. We’d made our bed and overslept in it; we were going to make the best of the situation no matter how hard it was raining. I couldn’t have asked for a better partner in crime on this day than Becky. We blasted music from my phone and sang and danced as we walked up the stone pathway up the mountain. Water flowed down the steps like a river and we were soaked from head to toe. 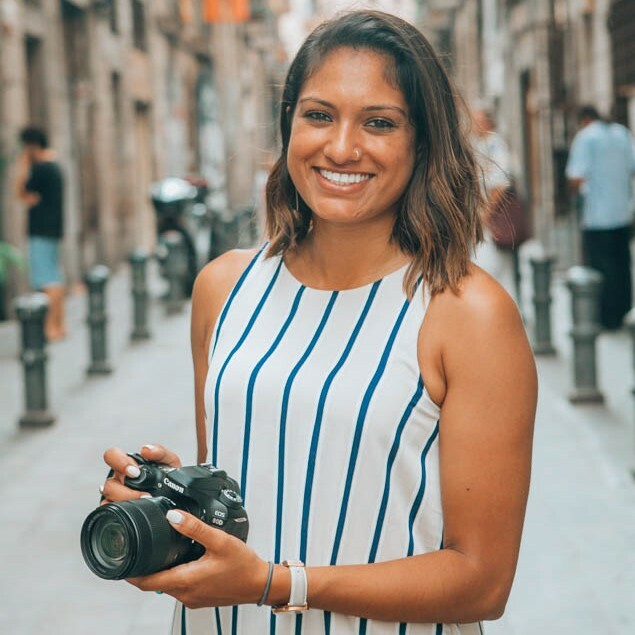 We exchanged pleasantries and said, “Hola” to every person walking down in the opposite direction and exchanged information on how much further each of our parties had to walk. It could have been a miserable time but morale was high. 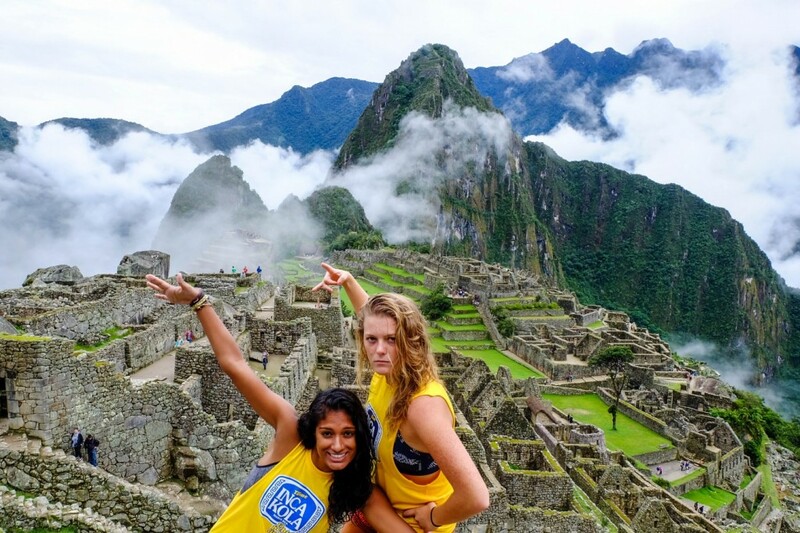 Morale was still higher than most when we finally made it to the entrance to Machu Picchu. It was still pouring and hordes of people waited to take the bus back down the mountain. “When I say Machu, you say Picchu!” Becky yelled to everyone, yet no one in particular. I, along with a lot of other tourists, was the “Picchu” to her “Machu”. People cheered, clapped, and some also looked at us quizzically like we were slightly delusional. The man who scanned our tickets laughed and joked with us as we stepped through the turnstile, telling us he really liked that cheer. We’d made it. Maybe I was slightly delusional because I half-expected blue skies to appear as soon as we pushed through the turnstile. Nope. It was still raining and we were still soaking wet. 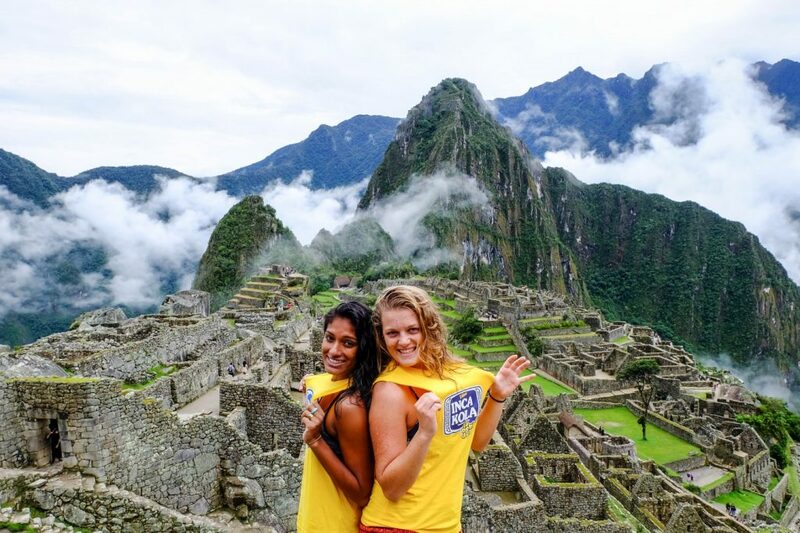 We found refuge and changed into matching Inca Kola cutoff t-shirts. Why? I don’t know! We once borrowed a Nerf football from a traveler in the Costa Rica–Panama immigration line and tossed it to unsuspecting passersby. I stopped asking myself why Becky and I do the strange things we do when I first met her in Cancun. Clouds and fog danced between the mountains. 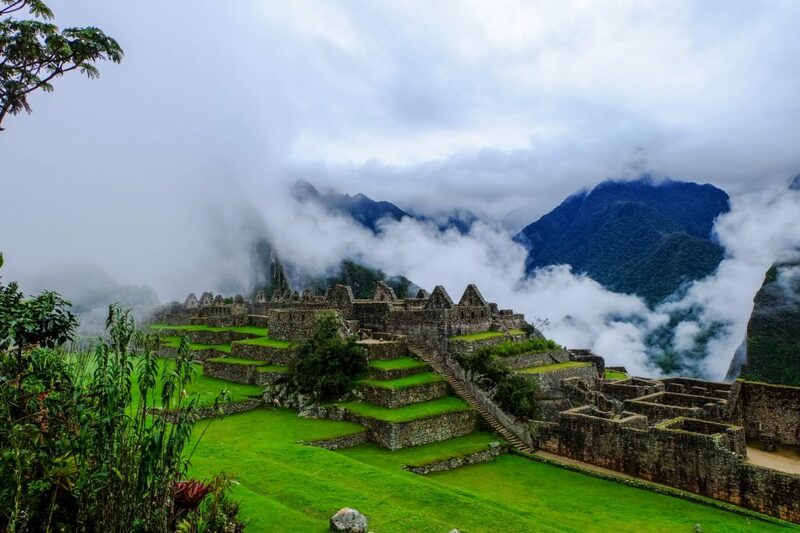 We were in a mystical Incan wonderland. We even saw llamas…or alpacas? Honestly, I still can’t quite tell the difference. 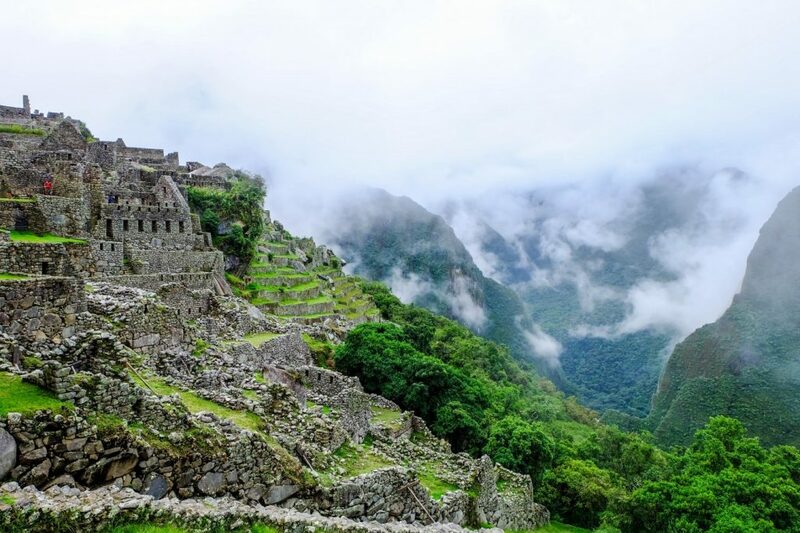 Though they weren’t wild, it still added to the Machu Picchu effect. It felt unbelievable to be standing among stone ruins that had been perched atop the green mountains for centuries. Like, I literally couldn’t believe we’d made it. It was still raining and we couldn’t see that iconic view you see in everyone’s Facebook or Tinder profile photo, but we laughed in bewilderment that we’d actually made it. We had the rest of the afternoon to explore Machu Picchu as we waited for the fog to clear so we could see everything. To have some fun, we turned on my GoPro and pretended we were filming an episode of House Hunters International. Why? Well, what better way to survey the grounds? Our episode even featured a cameo from Beth, another girl I met in Montañita! Looking around us, we couldn’t help but wonder how all of this was even possible. It reminded me of a conversation I had with Penny, an interesting woman from Montana I’d met at the Lima airport before I spent the night next to the Departures gate. Penny smelled like incense and felt so small in my arms when I hugged her goodbye, but she was quick-witted and hilarious. She told me about her visit to Machu Picchu and questioned how the Incans could have moved those rocks and built their community atop the mountains. She suggested they had help – alluding to alien help I think – but I’m still not so sure about that one. She was right about one thing: it really is incredible how the Incans had constructed their buildings with such precision. We still don’t exactly know how they’d cut massive rocks and didn’t need mortar to hold together their structures. They didn’t even use the wheel and likely used hundreds of men to move these stones. Just standing in the presence of something so old and complex was surreal to say the least. 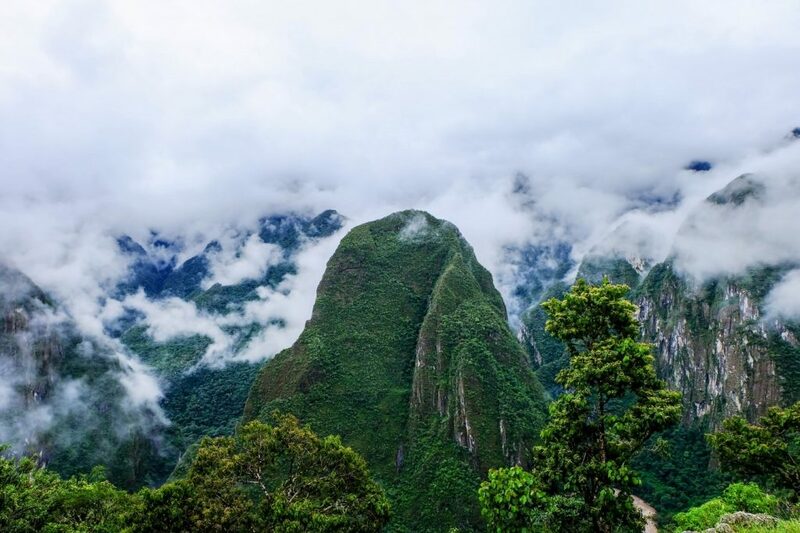 Sure enough, the clouds did separate and we saw Machu Picchu in all its glory. That view we’d seen hundreds of times in photos but really needed to see in person to believe it’s real. We set up my self-timer and tripod and snapped a bunch of ridiculous photos, then sat and just took in our surroundings. We reminded ourselves before we left that we may never be here again. I remind myself of that many times when I’m traveling, but this time felt different. It was the culmination of a trip I’d always wanted to take. We closed our eyes and made silent wishes to the Incan gods, blew kisses to the mountains, and left. We really wouldn’t have had as much fun if it was clear and sunny the entire time. Magic was in the clouds that day, I’m sure of it. Our van ride back to Cusco proved to be even worse than the first ride. We realized after it was too late that we didn’t actually have paper tickets denoting our van company or driver’s name. We paid another driver to use his cell phone and after Becky exchanged some choice words with the man who sold us the tickets, we were instructed to basically just ask around for a guy named Jaime. Solid plan. The best part of this chaos was that among the groups of people trying to find their drivers, I bumped into another friend I’d met in Cusco! We all were lost; it was comical that this was the most difficult part of the Machu Picchu trip for everyone that day. In the end, most of the friends I’d bumped into along the way were on the same van with me. The rest of this story is almost pointless but it’s kind of funny (not at the time, but now that it’s over). Jaime, the van driver, didn’t have a list of the passengers he was supposed to drive back to Cusco. We waited for two hours as he confirmed and reconfirmed who was in his van. He pulled away without two passengers, stopped in town to look for them, left Becky and a few others in the street when he drove away again looking or the first two missing passengers, and finally rounded us all up. Oh, and sometime before that he left his baby daughter in our care while he socialized with other drivers. It was absurd. Jaime drifted across the median and even veered too close to the cliff’s edge a few times while driving. Exhausted, I wouldn’t let myself sleep; I wanted to be alert in case we actually did get in an accident. Those roads are Bolivia’s Death Road level of narrow and scary. Eight hours later (two more than anticipated), we arrived in Cusco in one piece, thankfully. Sometimes you need to tell your friend, “Hey, let’s go on an adventure”. Becky and I knew we’d get to Machu Picchu, but we didn’t expect it to end up quite like this. Still, we both wouldn’t have had it any other way.